This is an extremely rare example of G. Woolworth Colton's 1883 vertical pocket map of New York. 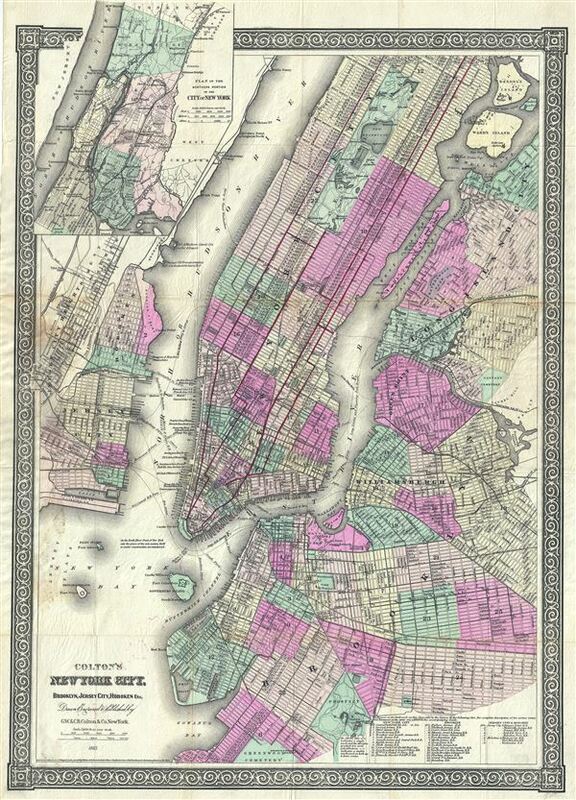 This important map, first issued in 1865, marks a significant rethinking of the standard Manhattan map. Previous maps of New York City tended to represent only the lower parts of Manhattan (on the Burr model) or orient the city horizontally with the top of the map facing west (as in the Commissioner's Plan). With the opening of Central Park in the mid-1860s, the previously rural northern portions of the city became not only accessible, but desirable destinations. Map publishers of the period, most notably Colton and Johnson, were forced to reconsider their mappings in order to more properly locate Central Park and its environs in the heart of New York City. This pocket map was initially issued in 1865 as a prototype to test the new map before it was included in the Colton's Atlas of 1866. Johnson began including a very similar map, with slight modifications, in his atlas starting in 1867. The map itself is oriented to the north and covers Manhattan Island from Battery Park to 125th Street. Also covered are adjacent portions of Brooklyn (Williamsburg and Greenpoint), Queens (Long Island City, Hunter's Point, Ravenswood, and Astoria), Jersey City and Hoboken. Central Park is shown in full with excellent interior detail. An inset in the upper left quadrant details upper Manhattan and parts of what is today the Bronx. Throughout Colton identifies streets, avenues, city wards, ferries, piers, rail lines, and even important buildings. A chart in the lower right quadrant offers more information with regard to the city's various railroads. This map is copyrighted to 1865 in the lower left quadrant, but updated below the imprint to 1883. Published from Colton's 182 William Street Office, New York City, New York. Very good. Minor creasing and wear along original fold lines. Minor spotting at places. Accompanied with original cardboard binder. Haskell, D. C., Manhattan Maps: A Co-operative List, 1148 (1865 edition).